I recently read a lengthy article on the news website ProPublica about the myth of drug expiration dates. The really, really quick version is that medications are safe and effective years after the expiration date. If you want a little more background, keep reading. Before a drug comes to market, as required by the FDA, it undergoes testing by the manufacturer to determine how quickly (or not) it breaks down. The FDA reviews the testing results, and then recommends an expiration date, which is usually 2-3 years. This ensures that the drug will be safe and effective if used during that time. Once a drug is expired, pharmacies, hospitals, and doctors offices are required to throw them away. Many consumers also do the same. But is a drug still safe and effective after the expiration date? And if so, for how long? Drug manufacturers do not test drugs after the expiration date because there is no incentive, nor are they required, to do so. But a pharmacist for the California Poison Control System, and scientist at Cal-San Francisco recently tested some medications dating back 30-40 years. These included antihistamines, pain relievers, and stimulants. The findings surprised both men- the compounds in the drugs were essentially stable and just as potent as if they were new! It turns out that the FDA has known this for years. The federal government has, for decades, been stockpiling large amounts of medications, antidotes, and vaccines at secure locations in case of a national emergency. The military, CDC, and the VA system also do not discard most expired medications, saving the government $600- $800 million a year. Another study done in 2006 also showed that many medications were stable after their expiration date. However, a few were not, including albuterol (for asthma), diphenhydramine (for allergies), and an anesthetic made from lidocaine . But there are no reports of anyone ever being harmed by taking an expired drug. China has some of the highest rates of myopia (nearsightedness) in the world, and their government is trying to do something about it. It is estimated that 70% of Chinese teenagers are nearsighted. As part of an initiative to reduce the incidence of myopia by the year 2030, this past August, the Chinese government called for placing limits on the sale and use of video games. It has long been thought that there is a link between prolonged near work and myopia. Therefore, they want children to limit the use of electronic products for non-learning purposes to 1 hour per day and no longer than 15 minutes at a time. Here’s a quiz for you. 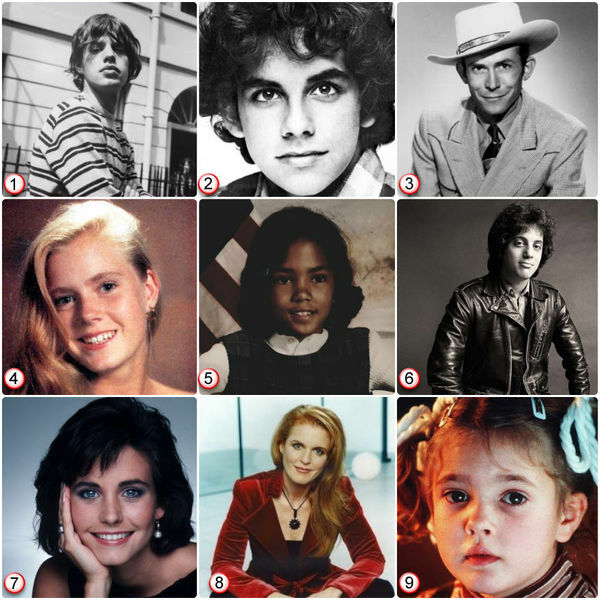 Pictured below are well know celebrities/famous people when they were younger. Can anybody get all 9? I got 2 right. I’ll post the results in a few days. I definitely know three celebrity names. Four others I think I recognize. Thanks for posting! So close. You missed one. Thanks for posting the expired drug info, I almost discarded plain Mucinex dated expired December, 2018. First of all, how did everyone get #5 Halle Berry correct? Secondly, you missed one- #2. #2 is Ben Stiller. This is great! I only got 3 lol Thanks for the drug info and game! You’re welcome, Jody. Thanks for playing.